Kentucky's long-range transportation plan calls for the widening of I-65 to at least six lanes through the entire state. This first stretch of interstate to be widened as part of this effort is the seventeen miles from mile marker 26 to mile marker 43 in northern Warren County.1 Work on this section of highway completed during Fall 2003. The construction project was maintained in such a way that two lanes of traffic in both directions remained open at all times. When the project started the inside lanes in both directions were closed and traffic was shifted onto the shoulder. During this phase a new drainage system and a Jersey Barrier was constructed in the median. When work was complete in the median, the old lanes were reconstructed. During part of this phase of construction, the lanes heading the same direction were separated by the new Jersey Barrier. That is traffic in the left lane was separated from traffic in the right lane by the new Jersey Barrier. This configuration has been used by the Kentucky Transportation Cabinet before; Sherman Cahal reports that he observed such a configuration during the reconstruction of a bridge on Interstate 275. The project also involved the reconstruction of the twin bridges over the Barren River as one bridge and the replacement of several overpasses. Picture taken at the beginning of the split. In the right lane of traffic during the unusual traffic split. In the right lane of traffic during the unusual traffic split on a bridge over the Barren River. The end of the unusual traffic split. Shows the temporary barrier separating the north and south bound lanes and the permanent barrier which currently separates the south bound lanes. Shows the beginning of the split of the south bound lanes as view going north bound. The Bowling Green Daily News reported in this Aug. 10, 2001 article that I-beams from the I-65 bridges over Barren River were being recycled for use in the construction of pedestrian bridges at Western Kentucky University. These pictures show the recycled I-beams being stored at the university and the bridge from which they were removed. Also there are pictures from several overpasses along the construction project. Shows the highway and railroad tracks over which the pedestrian bridge will be built. The recycled I-beams are obscured by trees. One of the recycled I-beams can clearly be seen. Several of the I-beams can be seen. The end of the I-beams. This bridge is currently being widened. This shows the division between the new roadbed and the old roadbed. Shows where the old roadbed has been removed and a new roadbed is being built. A view of the empty supports from the level of I-65. Another view of the separation of the new roadbed (currently carrying the south bound lanes) and the old roadbed (currently the north bound lanes). An old Kentucky right of way marker. This shows the south bound bridge being dismantled. Traffic traveling in the temporary south bound lanes and old north bound lanes is visible. This shows the abandoned south bound lanes, the temporary south bound lanes which are divided by a Jersey barricade, and the north bound lanes. 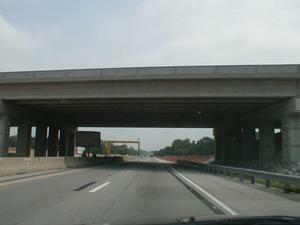 A newly completed overpass over I-65. An overhead view of I-65 showing the split south bound lanes. An overhead view of I-65 showing the old abandoned south bound lanes. An overhead view of I-65 showing the old abandoned south bound lanes and the beginning of the split in the south bound lanes. An overhead view of I-65 showing the beginning of the split in the south bound lanes. An overhead view of I-65 showing the shifted north bound lanes. Beams used in the old overpass. The approaches for this overpass are not yet complete. The south bound lanes of I-65. The north bound lanes of I-65. A traffic island on I-65. A traffic island on I-65. New lanes being added to both the north and south bound lanes are visible. A contrast of the old railing on the north bound bridge and the new railing on the south bound bridge. A view of the difference between the new roadbed and the old roadbed. This shows one end of the south bound bridge. 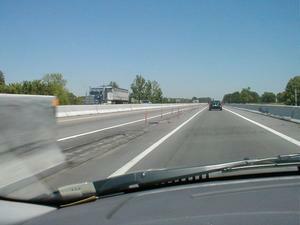 This picture is taken on the side with new lanes. This shows the split of the old and new roadbed on the south bound bridge. It also shows the use of old and new supports. This shows the split of the old and new roadbed on the south bound bridge. The old road bed is on the right and the new is on the left. Shows the new lanes added to the south bound bridge. Shows a head on view of the new lanes added to the south bound bridge. A view of the north bound lanes from the south bound bridge. These are the new lanes being added in the north bound direction. Shows the new lanes that have been added to the north bound bridge. Shows the separation between the new road bed and the old road bed of north bound bridge. The new is on the right and the old is on the left. Shows the view of the construction project while traveling on I-65. I-65 north of Elizabethtown, the old Kentucky Turnpike, was widened to six or more lanes during the 1980s before plans existed to widen the interstate south of Elizabethtown. Bowling Green Daily News: Gift ensures walkways (Aug. 10, 2001) - This Daily News article describes how scrap I-beams from the dismantled bridges over Barren River will be used to build pedestrian walkways at Western Kentucky University. KentckyRoads.com: Interstate 65 - Information about Interstate 65 through the state of Kentucky. Kentucky Transportation Cabinet: District 3's I-65 Presentation - A presentation prepared by Chris Profitt of the Kentucky Transportation Cabinet with pictures of the reconstruction of I-65 in Warren County. 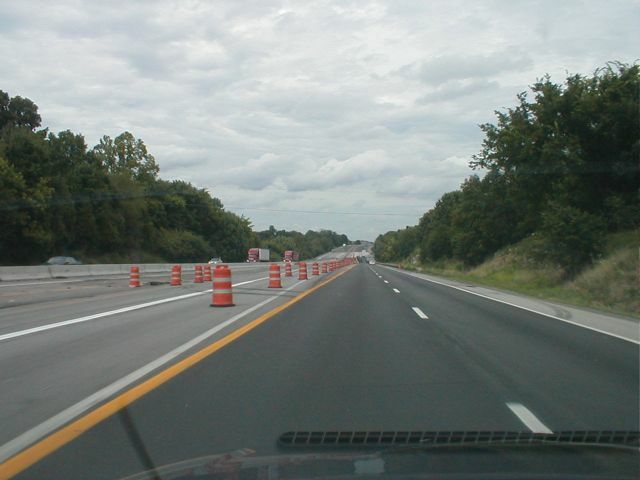 BOWLING GREEN, Ky.  Kentucky Transportation crews will be paving this week on the interstate between mile markers 15 and 20 (from north Simpson County to just south of the Natcher Parkway interchange) from 6 am until 7 pm. Two lanes of traffic will be open in each direction. Motorists are advised to use caution and be alert for trucks entering and exiting the work site along this area. 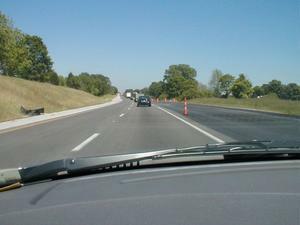 I-65 construction between Bowling Green and Smiths Grove is complete. A few miles of the interstate near the Louie B. Nunn Cumberland Parkway are now under construction. This is part of a project to widen I-65 to six lanes from the Tennessee state line to Elizabethtown. 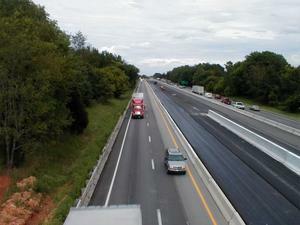 The new intersection between I-65 and Cemetery Road (KY 234) is complete and open. It is now Exit 26 on I-65. Work to widen US 231 between Bowling Green and Alvaton is complete. Work has now started on the US 231 project to the south and east of Alvaton. US 231 is being widened to four lanes from Bowling Green to Scottsville. The City of Bowling Green and Warren County are funding work to rebuild and widen Cave Mill Road from Scottsvile Road (US 231) to Dishman Lane. The Natcher Parkway extension from I-65 to US 231 east of Bowling Green is still planned; however, there is currently no funding for the project. The planning process for I-66 and the Bowling Green Beltline project continues. The new interchange between KY 234 (Cemetery Road) and I-65 in Bowling Green has opened. The interchange is just south of the Barren River and will be numbered as Exit 26. If the weather cooperates, the new interchange between I-65 and KY 234 near Bowling Green could be complete by Thanksgiving. The newly widened I-65 is now 6 lanes between the Barren River bridge just north of KY 234 and US 68 north of Bowling Green. A $1 million bonus was awarded to Scotty's Contracting for completing a 3-mile section of widening work on I-65 in Warren County ahead of an August 23 deadline. Scotty's stands to receive another $500,000 bonus if they can complete another section of the project from mile marker 30 to the Oakland exit before September 12. A three-mile section of I-65 in Warren County is expected to open soon. The contractor is being offered a $1 million bonus to complete the widening project by August 23. If they miss this deadline, there is a disincentive of $10,000 per day. This is the first time this incentive program has been used on a project in the area. I-65 is currently being widened from KY 234 near Bowling Green to the Louie B. Nunn Cumberland Parkway in northern Warren County. Bids will soon be let for widening projects north and south of the current construction area. This Bowling Green Daily News article reports that work is progressing on several road projects in Warren County. Work is expected to finish early on a project to widen I-65 to six lanes between Oakland and the Barren River. Work on I-65 between the Louie B. Nunn Cumberland Parkway and Oakland is expected to begin this spring. Work is also on schedule on rebuilding Scottsville Road (US 231) between Bowling Green and Alvaton. Eventually US 231 will be widened to four lanes between Bowling Green and Scottsville. 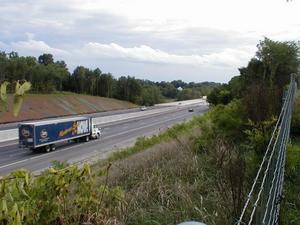 Work on a new interchange between I-65 and KY 234 has slowed for the winter. Also work on the Natcher Parkway is expected to begin soon. The interchange between the Natcher Parkway and I-65 will be reconstructed south of its current location. The Bowling Green Daily News reports in this article that a stretch of I-65 once known as "Death Valley" is safer now. Police claim this is because of increased police presence and that people are driving safer through the construction zone. Forty-six new images have been added of I-65 Construction. These images show scrap I-beams that are going to be used to construct pedestrian bridges and images from several bridges and overpasses along I-65. According to this August 10, 2001 article from the Bowling Green Daily News, Western Kentucky University will receive an unusual gift from the Kentucky Transportation Cabinet: scrap I-beams from two bridges over the Barren River that are being dismantled. The I-beams will be used to build a pedestrian walkway to a new parking lot on the University's campus. 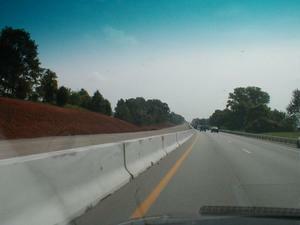 Two new pictures have been added to the I-65 Construction feature. They show the north bound view of the construction north of Exit 28 in Warren County.